The Smart Tag of RadCheckBox (Figure 1) lets you configure your control or quickly get help. You can display the Smart Tag by right clicking on a RadCheckBox control and choosing "Show Smart Tag", or clicking the small rightward-pointing arrow located in the upper right corner of the control. 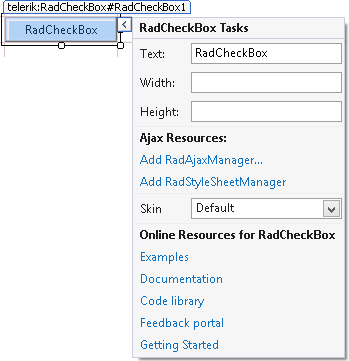 Figure 1: RadCheckBox's smart tag. Add RadAjaxManager... adds a RadAjaxManager component to your Web page. Add RadScriptManager adds a RadScriptManager component to your Web page. Add ScriptManager adds a ScriptManager component to your Web page. The Skin drop-down displays a list of available skins that you can apply to your control, along with an example of what the RadCheckBox control looks like for each skin. Assign a skin by selecting the one you want from the list.